This entry was tagged Jeff Goins, Steven Pressfield, The War of Art: Break Through the Blocks and Win Your Inner Creative Battles, Writer, Writer Resources, Writers Resources, Writing, Writing Exercises. Bookmark the permalink. I am published but still have difficulty saying it, it’s like wearing my mum’s high heels when I was little. Do poets count? 🙂 I love the fact that I’m a writer….my mind goes ALL the time. I’m still getting used to the blogging thing. Ya’ll have some great feels to yours from what I’m seeing. So, I have a LOT on my plate…. (in no particular order) I am a full-time student (Physical Therapy Assistant program)/father/poet/40 hr + work week Nursing assistant/and. . . .writer. I had a touch time as well mentioning that to people. I don’t know what images pop in peoples heads, but I see their faces. Some with an: “oh….o.k.” And others are excited that I’m published (did I mention that above)? It’s a process…I hope 10k books doesn’t make you a said writer because if so….I have a LONG way to go. Thanks for sharing. Be optimistic Vikki. We will. . . .we WILL hit 10k. My plan is for a series of children’s books, along with books of poetry which will be written under my pen name KonciouSLea. Sometime you really have to go deep within yourself for some of what you write. Deep. I have no idea when saying it is the right time, but good for you for saying it! 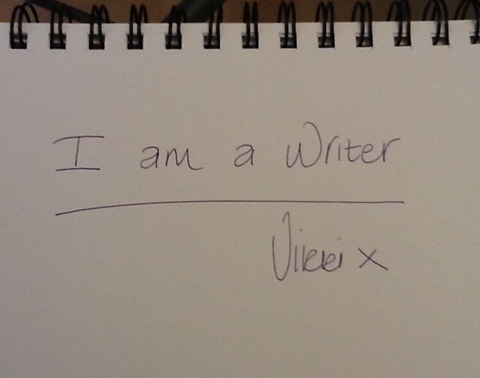 Vikki–What a great post and I’m going to check out the blogs you’ve mentioned. 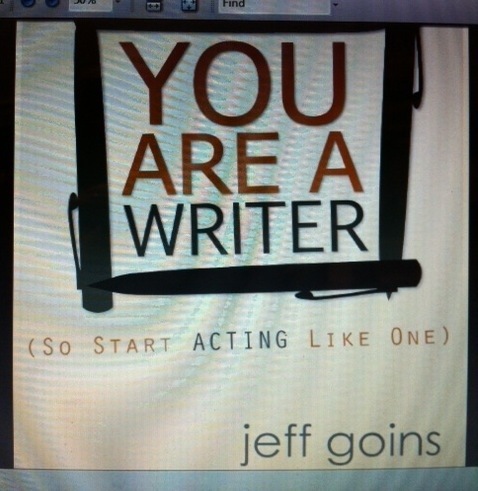 I wholeheartedly agree with proclaiming to yourself (and others ) that you are a writer! Act as if and fake it til’ you make it are all empowering affirmations which I totally agree with. You said it for yourself (BTW, I agree with you that you are) and now you’ve inspired me to do the same: I AM A WRITER. Thanks for the lovely, inspiring post. That sounds like a wonderful book! I’ve got to go take a look at it now. Like you, I have trouble calling myself a writer, though I’ve been practicing. The word has so much expectation behind it. If you call yourself a writer, you have to actually, uh, write. But I think that expectation is good. It’s one more thing that keeps us going when the path to publication gets tough. I know exactly how you feel hon 😦 It’s not fair is it! I am too goddammit! Writers rock!